The memorial at Mourneview Park. A war memorial at Glenavon Football Club’s Mourneview Park ground in Lurgan is to be temporarily covered up to facilitate the staging of European games. The painted tribute will be hidden during upcoming European matches because of football’s governing body UEFA regulations on emblems at football stadiums. The UEFA requirements place a strict stipulation on the Irish Football Association (IFA) to adhere to UEFA policy on the display of emblems. This will entail a temporary screen being placed around the memorial ahead of the Under-21 European Championship match against Albania on August 31. Glenavon chairman Adrian Teer said the club has not consulted about the memorial concerns as it is entirely a matter for UEFA and the IFA. “The IFA visited have visited the ground and said it needs to be covered, under UEFA instructions,” he said. 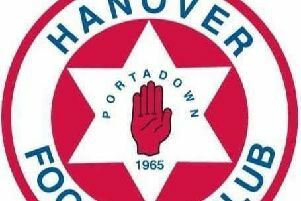 “Glenavon were not involved in it. The IFA takes over the ground for these matches. They are responsible for the overall organisation of them and ensuring that they are compliant with all the UEFA regulations. We as the host club don’t have a say in the matter,” Mr Teer added. Ulster Unionist MLA Doug Beattie described the UEFA rule as “stupid”. The ACT Initiative (Action for Community Transformation) Mid-Ulster branch said was important that the rules were adhered to in order to ensure the three qualifying matches went ahead.